Enjoy the light, ringing song of this small silver plated bell. 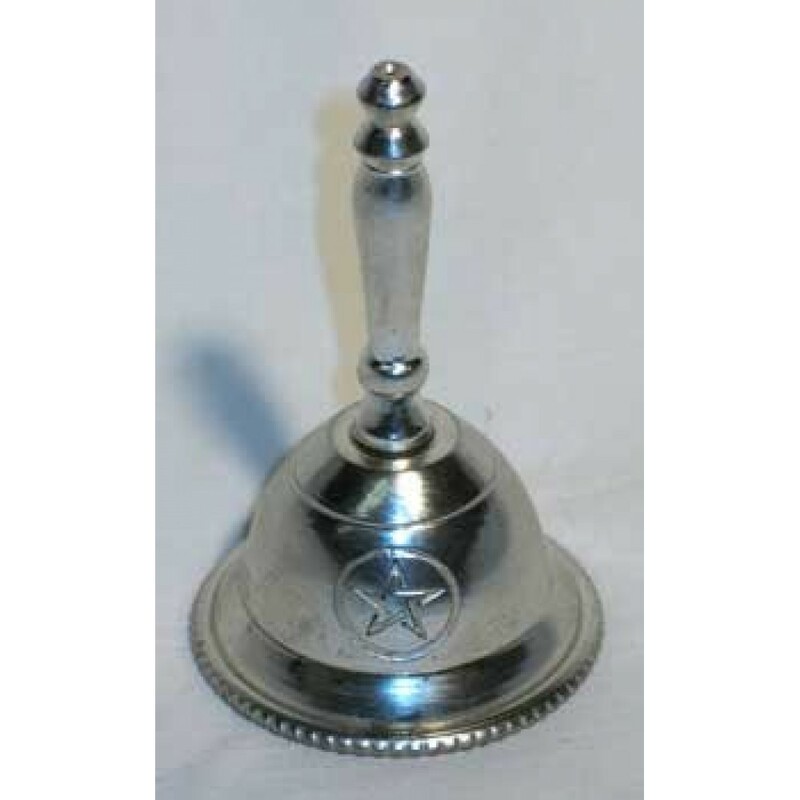 3 inches tall, with an engraved pentacle design and scalloped edges around its rim, the chime of this bell garners far more attention than one would expect from its size alone. Altar Tarot Cloth: Triple Goddess With Pentagram - 24" x 24" (Gold/Silver on Black Pentacle/Pentagram)Heavy Black 100 percent Cotton with fringed borders.Silver Triple Moon with Pentacle on Black with Golden Celtic Knot .. This 72" by 21" black altar cloth is an elegant trapping for your altar. Made of black fabric, it presents a repeated pattern of three silver pentagrams in the center, of equal size and like design. Framing this is a gol..
Crafted of cast iron with an embossed pentagram on front and back. This cauldron is a discrete 3" tall and 2 3/4" wide, with internal dimensions of 2 1/4" in diameter and 2" in depth, this squat cauldron rests on three, ..
Comes with an Attractive Velvet Pouch. The Earth element is the most powerful of all the elements. The Earth is our source of stability, yet a large Earthquake can destabilise us in a matter of seconds. The Earth gives a..